Indian Magic’s dam, Indian Crown, was not a prolific broodmare, but she also produced his half-sister Incoronetta (by Dargee), named 1964 British Reserve National Champion Mare and dam of three British national winners. These include 1963 British Reserve Junior Champion Female *Silvanetta (dam of three American champions including U.S. Top Ten Pleasure Driving Baskanette++). Incoronetta also produced 1968 British Junior Champion Female African Queen (by Oran), and 1973 British National Champion Mare Azara (by Manto). Indian Crown was a full-sister to *Indaia, imported by Roger Selby. *Indaia founded a very significant family in America as she produced four producers of National winners including Indraff (sire of 11 National winners and of 53 producers of National winners). The great broodmare sire Rapture (sire of 6 National winners in halter) was a grandson of *Indaia. Indian Magic sired a total of 94 get registered in Britain before his death in 1972 at age 28 (his last foals were foaled the year he died). Forty-nine of his offspring were male, and 44 were female of those registered in England. Of interest is that during his early years at stud he sired more mares (a ratio of 2:1), but at the end of his life his male offspring outnumbered his female almost 3:1! (Indian Magic also had one son imported en-utero to America and not included in his registered foals in Britain, and there may have been others exported en-utero as well). Of Indian Magic’s get, 24 are known to have been exported. Of these, 12 went to North America. Of his seven sons exported to North America, six had registered progeny, and all of these sired champions (four sired national winners). Four won show ring honors themselves. Of Indian magic’s five daughters who came to America, three produced national winners. The first Indian Magic offspring to be imported was his daughter *Serafire (ex Grey Royal), imported by John Rogers in 1952. She was named a 1958 U.S. Top Ten Mare. She produced just two foals in America, but both were national winners: 1962 U.S. Top Ten Mare Starfire (by *Serafix and thus triple Raktha), and 1967 U.S. National Champion Mare Indian Genii. 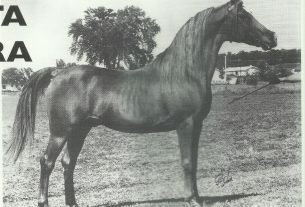 Starfire died shortly after her National win without progeny, but Indian Genii produced 5 champions including U.S. Reserve National Champion Pleasure Driving Magic Genii++ (dam of national winners in halter and performance) and U.S. Reserve National Champion Mare SX Geniis Pride+++ (also a national winner producer). The second Indian Magic offspring to be imported came to America in 1956 at age four. He was *Electric Storm (ex Silfina), and was imported by Nancy Magro. *Electric Storm was an English pleasure champion in America. He sired 149 registered get, 44 of them champions and eight of them National winners. He is thus Indian Magic’s most successful son imported to the U.S. His National winners were U.S. Top Ten Formal Driving Dun Kray Ahabi++, U.S. Top Ten Pleasure Driving Ima Electric+++, U.S. Top Ten English Pleasure AOTR Kel Thor, U.S. National Champion English Pleasure JOTR Royal Crabbet+/, U.S. and Canadian Top Ten Park Electryon+, U.S. and Canadian Top Ten Western Pleasure AOTR Big Mama+++, U.S. and Canadian Top Ten Native Costume Electric Impulse+, and U.S. Top Ten Jumper Electric Shocker. The next Indian Magic offspring imported went to Mr. and Mrs. J.L. Simpson of Alberta, Canada. 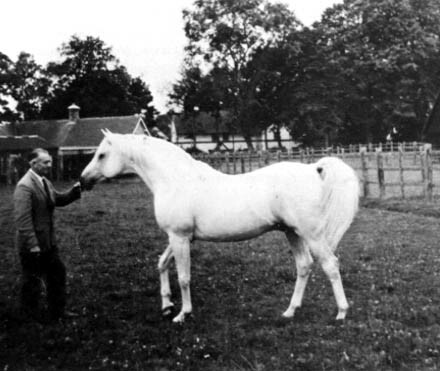 He was *Raziri (x Rosinella), foaled in 1955 and imported in 1959. 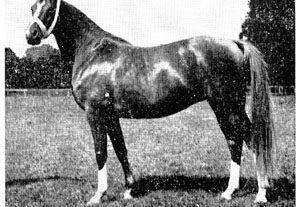 He died in 1968 and was used lightly at stud (he has just 28 registered get). Nonetheless, he sired a number of champions, including halter reserve champions Baziri and Zu Magic, park champion Razalissa, western pleasure reserve champion and pleasure driving amatuer champion Roaziri, Regions 7 and 8 Champion Gelding and Region 8 Champion English Pleasure AOTR and Top Five Pleasure Driving Sir Magic++, 1968 U.S. Top Five Futurity Mare Pure Magic, and U.S. Top Ten Jumper and twice U.S. Top Ten Jumper CHF Sarazi. *Raziri’s daughters were successful broodmares, with Pure Magic producing 4 champions and his daughter Valri producing 5, including Canadian national Champion Futurity Stallion and U.S. Top Ten Futurity Stallion Ashir. Two daughters of Indian Magic were imported to America in 1961. *Mellawieh (ex Mifaria) was a ten year old imported by Lewis Payne of Oklahoma. She has four American foals, and her daughter *Qatifah (by Manto) produced 2 champions. The other mare was *Magic Ribbon (ex *Blue Raffia), imported as a yearling by Frank Smathers of Florida. She has six registered foals. Four are champions: western pleasure reserve champion FF Magic Image (by Reymage), English pleasure reserve champions FF Graciela (by Ansata Ibn Sudan) and FF Burma (by Witezfix++) and halter champion FF Snow Fire (by *Bask++). In 1964 four different Indian Magic get were imported by James F. Lewis of Virginia. *Zilla (x Silent Wings) was a four year old and a full-sister to British Junior Champion Female Yemama. Her five foals in America do not have any champions tracing to them at present. *Flying Storm (x Taima) was a ten year old at time of importation and produced four American foals, including U.S. Top Ten English Pleasure and English Pleasure AOTR Magic Aurab+. *Lewisfield Magic=/ (x *Michelia) was imported en-utero. He was a successful show horse, with championships in halter and English pleasure, reserve championships in park, and was named 1970 U.S. National Champion Western Pleasure. He has sired 127 registered get, including Legion of Merit winner Burr Hill Magic Touch+ and U.S. and Canadian Top ten Sidesaddle Burr Hill Mysterian+. The final Lewis import was *Touch of Magic (x *Indian Diamond), who was seven when imported. He was a successful jumper in England, and sired 93 registered get in America. Four won National titles: 1973 U.S. Top Ten Mare Lewisfield Sprite (dam of 4 champions), 1975 U.S. Top Ten English Pleasure Lewisfield Lulu++, 1989 Canadian Top Ten Show Hack Myster Magic, and six time National winner Indian Bay (whose titles include U.S. National Champion Hunter and Canadian Reserve National Champion Hunter). The next Indian Magic import was also the oldest at time of importation. *Silver Moonlight (ex Silver Fire) was originally exported to Australia, and was imported to America at age 20 in 1969 by Andrew Sharf of California. He was a successful sire in Australia where his get included Australian Reserve National Champion Mare Electric Moon. Due to his advanced age, he got just 13 U.S. registered foals, two of them halter champions (GF Silver Lark and Moonlight Fantasy). An Indian Magic son was imported to Canada in 1970. He is *Indian Vanity++, four years old at the time of his importation by Margaret Fifield of Ontario. His dam is Silver Ripple, making him a three-quarter brother to British National Champion Stallion Silver Flame. *Indian Vanity++ had a good show career, being named 1973 Region 10 Top Five Stallion and Reserve Champion English Pleasure. He was awarded his Legion of Merit in 1975. He has no American-registered progeny. The final Indian Magic son to be imported is *RAS Indian Silver (known in England as Indian Silver). He was out of Dalika. 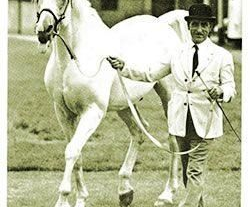 Prior to his importation at age six in 1976 *RAS Indian Silver sired 10 foals in Britain, including supreme halter champion *Aliha Ahs (also a halter champion in America) and the good broodmare Kasbana. After his importation by the Rhodes Arabian Stud of New York, *RAS Indian Silver won English pleasure reserve championships and sired American champions such as halter champion Silver Bear. Besides the twelve offspring exported to North America, Indian Magic had twelve other get exported from Britain. His daughter Silver Magic (a full-sister to *Silver Moonlight) went to Australia after producing her son Silvadoris by Oran. Indian Magic’s son Rossfennick (a full-brother to *Raziri) was exported to Australia as a youngster. The Indian Magic daughter Shamarina (x Sharfina) went to Chile. Another daughter, Shakra (x Rissada), went to Holland. Another daughter who went to South America was Mandahyla ( x Myolanda), who was exported to Argentina in 1977 as a twelve-year-old. Indian Magic’s daughter Magic Gold (x Sunset) went to Australia as a youngster. The Indian Magic son Hindostan (x Indira) was exported to Holland. The Indian Magic daughter Kamelia (x Kazra) was the Reserve Champion Mare at the Royal Lancashire Show in 1971 and produced two foals in Britain before being exported to Switzerland in 1976. Another daughter, Soumana of Fairfield (x Hadassa), had 11 foals in Britain before being exported to Sweden in 1984. The Indian Magic son Babur (x Roshina) went to Belgium as a two-year-old. Bint El Sehr (x Muzri) went to Australia as a two-year-old. The last foal of Indian Magic, the stallion Carrik Indianora (x Nerinora), was exported to Israel as a four-year-old. Of the Indian Magic get remaining in Britain, six achieved National wins. Yemama (x Silent Wings) was the 1962 British Junior Champion Female. Majal (x Mifaria) was the 1968 British Junior Champion Male and 1969 Reserve Junior Champion Male. Astur (x Rissalma) was the 1969 Junior Champion Male, 1970 Reserve Supreme Champion Stallion and 1971 Reserve Champion Stallion at the British Nationals. In 1972 Fanfara (x Tarantella) was named the Reserve Junior Champion Female. The 1974 British Reserve Ridden Champion was the Indian Magic son Silver Rain (x Silver Sheen). Indian Magic’s daughter Magenta (x Magindra) was named 1979 British Reserve National Champion Mare (and her foal was named the National Champion Foal that year). Local champions in Britain by Indian Magic include his daughter Comforts Caravel (x Extra Special), a reserve champion at halter, Indian Flame II (x Nerinora), champion stallion at the 1968 Bath and West Show, Shirar (x Sirella), champion stallion at age 12 in 1977 at both the Bath and West and Royal Windsor shows, halter champions Blue Magician (x Karpathia), and Indian Diadem (x Dancing Diamond) who sired the 1984 Israeli National Champion Stallion Triple Crown. Of the 70 Indian Magic progeny who remained in Britain, 21 left no registered progeny. Of the remaining 49, several proved quite prolific. His son Scindian Magic sired 86 registered get through Volume 15 of the A.H.S. Studbook and his son Indriss has get registered through the same volume. His daughter Indian Starlight had 12 foals, as did his daughters Comforts Caravel and Magic Pearl. Ten Indian Magic get produced British National winners. His son Astur sired 1972 British National Champion Gelding Silver Splendour. 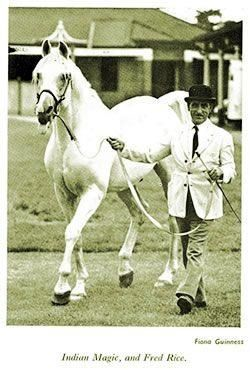 His son Indriss has sired two National winners: 1974 Junior Champion Male Nasib (later exported to Oman), and 1979 Reserve National Champion Gelding Sky Monarch. Special mention must be made also of Indriss’ daughter Kazminda, named National Champion Foal in 1970 and winner of the Princess Muna Saddle of Honour in 1985 abd 1986 for Best Progeny Group at the British Nationals. Six of her foals are champions in Britain, Europe, and Brazil. Indian Magic’s son Scindian Magic sired 1974 and 1977 British Supreme Champion and 1975 and 1976 Reserve Supreme Champion Mare Sheer Magic (considered by many to be one of the most beautiful mares ever foaled in Britain). His son Indian Flame II has sired 2 National winners: 1975 Reserve National Champion Gelding Sharukh and 1982 Reserve Supreme Stallion and Champion Senior Stallion Silver Flame. Majal, another Indian Magic son, sired 1975 Reserve Ridden Champion Zahal. His son Indian Star is the sire of 1976 Reserve Champion Gelding Dancing Apollo. His son Silver Rain sired 1981 National Ridden Champion and Reserve Champion Gelding Silver Knight. Three Indian Magic daughters have produced National winners in Britain. His daughter Marinella is the dam of 1974 Junior Female Champion and 1977 Reserve Champion Mare Vonitsa (who is double Indian Magic as her sire, Magic Argosy, is an Indian Magic grandson). Indian Magic’s daughter Enchantment was dam of 1979 Junior Champion Male Midnight Gold. Another daughter, Indian Starlight, produced 1961 Junior Champion Male and 1962 Reserve Supreme Champion Male Blue Magic. Indian Magic lived up to his name for he enchanted all who saw him, whether at home or in the show ring. He achieved a new standard in the show ring (much as *Bask++ did in America) when he gained acceptance for the larger type of classic Arabian horse. His wizardry extended to siring exceptional get who passed on his type, motion, and presence. Indian Magic’s influence is truly an international one, felt throughout Europe, North and South America, and Australia.